Critical congenital heart disease (CCHD) is one of the major causes of infant mortality. The prevalence is approximately 1–4/1000 live births.,,,, CCHD is a group of life-threatening cardiac lesions that require early intervention.,, Physical examination is insufficient to detect all pathologies during birth hospitalization because of mild hypoxemia, ventricular dysfunction, and patent duct as well as the absence of murmur. Undetected newborns are then discharged home where related symptoms can later be developed. Serious morbidity and mortality normally result from hemodynamic compromise which comes in the form of cardiovascular collapse and end-organ damage. Approximately 20%–30% of CCHD cases are undiagnosed during birth hospitalization.,, The mortality rate of late detection is twice of those detected early. In this work, we aim to navigate the accuracy of POS protocol for early detection of CCHD in asymptomatic term newborns and to identify the missing cases for those having negative POS initially via monitoring health record for 6 months. This study was approved by the Ethical Committee of Hatyai Hospital (HH) in accordance with the Helsinki declaration. HH is a regional public hospital in Hatyai district, Songkhla province, located in the south of Thailand. Based on the latest registration record, the population of Hatyai district is 397,397. Because of the universal health coverage scheme of the National Health Security Office, HH has become the referral and cardiac center of the region. Infants with cardiac problems are directly referred to HH for further medical processes. The hospital has a birth delivery rate of around 7000 cases annually. The retrospective consecutive cohort study was performed in all healthy term newborns at the postpartum ward in HH. Central electronic medical records of newborns from June 2016 to September 2017 were used in this study. To account for late detection of CCHD, 6 additional months' follow-up medical information of those discharged home was collected using their later medical history or direct communication. All asymptomatic newborns with a gestational age of >37 weeks were chosen for this study. Sick newborns before the screening or outborn neonates were excluded. Medical records including history, physical examination, POS results, and investigations during birth admission and after discharged were reviewed. POS was performed in all healthy newborns at the postpartum ward whose ages were above 24 h before being discharged home. We used the Novamatrix Oxypleth Pulse Oximeter model 520 A (Soma Technology, Inc., USA, FDA approved, product code: DQA, recall number: Z-1559-2009, event ID: 52041) with reusable neonate soft sensor probes. The probe was initially placed on the right hand and then on either the left or right foot. Oxygen saturation (SpO2) was recorded when the pulse oximetry showed stable waveforms. A negative POS result was registered when SpO2 in the right hand (preductal) or foot (postductal) was >95% with the maximum of 3% difference between preductal and postductal SpO2. It was considered positive if preductal or postductal SpO2 was <90%, or if preductal and postductal SpO2 were between 90% and 94% or if the difference between preductal and postductal SpO2 was more than 3% after three repeated screenings with 1 h apart. Evaluation of life-threatening conditions was carried out by attending pediatricians. An echocardiogram was performed by pediatric cardiologists in all newborns with positive screening result and those showing clinical signs of having CCHD. CCHD is defined as severe congenital heart lesions requiring surgical or catheter intervention in early life.,, The lesions could be ductal-dependent pulmonary or systemic circulation or nonductal dependent with hypoxemia., The CCHD was diagnosed by using echocardiogram as a gold standard. Early detection of CCHD is defined as CCHD detected during the birth hospitalization. Late detection of CCHD is defined as CCHD detected after discharged home from birth hospitalization with negative POS for CCHD. The clinical parameters were analyzed by mean ± standard deviation (SD), median (range: minimum–maximum), interquartile range (IQR 25th–75th percentiles), percentiles, frequency, and percentage as appropriate. Diagnostic accuracy of the cohorts was assessed by using sensitivity, specificity, negative and positive predictive values, false-positive rate, and diagnostic accuracy (with corresponding 95% confidence interval [CI]). The analysis was performed using the SPSS software version 13.0 (SPSS Inc., Chicago, IL, USA). The list-wise method was used for handling the missing data. We had 9098 live births during the study period. Preterm and sick newborns before the assessment for POS were excluded from the study. Twelve cases of CCHD developed clinical symptoms shortly after birth before the screening as detailed in [Figure 1] and [Table 1]. A total of 265 cases were missing due to the lack of subsequent medical records. The 7137 asymptomatic term newborns were enrolled as the study profile in [Figure 1]. The average birthweight and gestational age were 3123 ± 416 g (mean ± SD) and 38.9 ± 1.2 weeks (mean ± SD), respectively. The median screening age was 39.5 h (range 24–192 h, IQR 26–48, 99th percentile = 100). The percentage of screening age of 150 h or more was accounted for 0.08% (6 out of 7137), and 3591 newborns (50.3%) were male. The incidence of CCHD was 2.1/1000 live births (19 out of 9098) without a prenatal diagnosis [Table 1] and [Table 2]. CCHD was detected early before timing for POS in 63.2% of cases (12 out of 19). Coarctation of the aorta (COA) was found in 5.5/10,000 live births (5 out of 9098). Three true positives and three false positives were detected as shown in [Figure 1] and [Table 2]. Four false negatives were diagnosed as COA. One was detected from physical examination before discharged home. Three other cases indicated late diagnosis as detailed in [Table 2]. 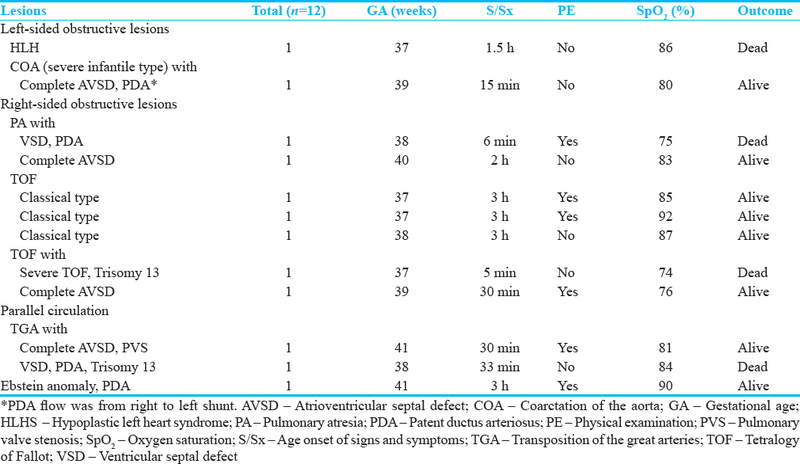 The accuracy of POS for CCHD is shown in [Table 3]. This screening had a sensitivity of 42.86% (95% CI 9.90–81.59) and a specificity of 99.96% (95% CI 99.88–99.99). The combination of POS and physical examination improved the sensitivity up to 57.14% with a specificity of 99.73%. Three cases of CCHD were late detection (3 out of 19, 15.7%). Two of them presented with congestive heart failure at 19 days and 125 days of life. The other one came to the emergency room with cardiac arrest at the age of 40 days [Table 2]. All of them were COA; one was associated with a single ventricle. The overall mortality rate of CCHD was 36.8% (7 out of 19). The mortality rate of early detection was 37.5% (6 out of 16). Late detection of CCHD had a mortality rate of 33.3% (1 out of 3). The targets of POS are primary and secondary targets of CCHD. The sensitivity of POS for CCHD in primary targets is greater than that in secondary targets. Primary targets usually present early with hypoxemia.,,, The seven primary targets are hypoplastic left heart syndrome, pulmonary atresia, tetralogy of Fallot, dextro-transposition of the great arteries, tricuspid atresia, truncus arteriosus, and total anomalous pulmonary venous return. The five secondary targets of the screening are COA, double-outlet right ventricle, Ebstein anomaly, interrupted aortic arch, and single ventricle. The sensitivity of POS in our study (42.86%) was lower than that in other studies (65.5%–100%),,, because of the following reasons: first, 63.2% of cases with CCHD were already detected before the screening and 83.3% of them were primary targets and second, there was a high percentage of cases diagnosed as COA (57.1%) in this screening study. As it is known that secondary targets of screening, especially COA, have a low sensitivity of POS for CCHD (36%–53.3%),,,, we found very high percentage of COA (100%) in late detection, but there were only two cases (12.5%) for early detection. Whereas other studies found COA of 33%–54% in late diagnosis and 17% in early diagnosis., Our incidence of COA (5.5/10,000 live births) was also higher than that from another study (3.7/10,000 live births). Finally, our study had a low number of CCHD (only seven cases) which undermined the power of a study. This was due to too small sample size or short duration of the study. We found that physical examination had lower sensitivity (28.57%) than POS for CCHD detection. In addition to physical examination, POS helped to decrease late detection of CCHD in four cases (57.1%). It confirms that POS is a useful method for early CCHD detection in daily practice. A false-positive rate in this study (0.04%) was lower than that given in previous studies,, because sick newborns from other causes were already excluded before the screening. One of our late diagnoses of CCHD was COA diagnosed with a single ventricle, with a preductal SpO2 of 95% and a postductal SpO2 of 95%. Specifications of our pulse oximeter had an accuracy of SpO2± 2% (for SpO2 80%–100%). We proposed to repeat POS if both preductal and postductal SpO2 are 95% in our hospital. This idea requires further study. For late detection of CCHD, our work was extended for 6 additional months of follow-up for those with negative POS result after discharged home, whereas other studies had offered the follow-up for <6 weeks after discharged home.,,, We found a higher percentage of late diagnosis of CCHD in those with negative POS (15.7%) than another study (4.4%). However, we had the same percentage of late detection of CCHD according to the simulation model given by Ailes et al. (15%). Previous studies reported that late detection cases had a clinical presentation at an age of 3 days–26 days.,, From our finding, two cases of CCHD were diagnosed at 40 days and 125 days of age. This reflects that perhaps we should carefully evaluate the clinical signs and symptoms of CCHD including POS extended to 2 months or 4 months of age at a well-baby clinic. The mortality rate of undetected cases in our study (33.3%) was similar to that of other studies (27%)., However, we had a higher mortality rate of early diagnosed CCHD at 37.5% as compared to another study (16%). This was because our cases were associated with syndromatic CCHD and more complex and severe CCHD in early detected CCHD. Nevertheless, there was no death in early detected COA. We found one death for late diagnosis of COA. This study was a retrospective cohort study which had certain limitations in data collection. As a result, possible errors in cardiac examination records and human errors in performing POS may exist. However, the missing data (3.6% [265 of 7402]) yielded insignificant influence on results and conclusion. The proportion of the missing data of <5% is acceptable for data analysis., Another weakness was a low power of the study due to a small sample size and a low number of index cases. This study had a low sensitivity of POS for CCHD, <50%. POS helps to decrease the diagnostic gap in the primary targets, but this is still questionable for the secondary targets. However, we continue using POS in our practice because of the following findings from our study: first, POS combined with physical examination could decrease the late detection of CCHD by half and second, there was a higher mortality rate of late detection of COA as compared to the early detection of COA. PPI may be the other additional tool for early detection of CCHD, especially in left ventricular outflow tract obstruction. Our work indicates that the time duration for assessing CCHD should be prolonged to 4 months in order to detect false-negative POS. We would like to give our special thanks to Dr. Wanida Limmun for her assistance in statistical analysis. Engel MS, Kochilas LK. Pulse oximetry screening: A review of diagnosing critical congenital heart disease in newborns. Med Devices (Auckl) 2016;9:199-203. Botto LD, Correa A, Erickson JD. Racial and temporal variations in the prevalence of heart defects. Pediatrics 2001;107:E32. Hoffman JI, Kaplan S. The incidence of congenital heart disease. J Am Coll Cardiol 2002;39:1890-900. Mahle WT, Newburger JW, Matherne GP, Smith FC, Hoke TR, Koppel R, et al. Role of pulse oximetry in examining newborns for congenital heart disease: A scientific statement from the AHA and AAP. Pediatrics 2009;124:823-36. Liske MR, Greeley CS, Law DJ, Reich JD, Morrow WR, Baldwin HS, et al. Report of the Tennessee task force on screening newborn infants for critical congenital heart disease. Pediatrics 2006;118:e1250-6. Wren C, Reinhardt Z, Khawaja K. Twenty-year trends in diagnosis of life-threatening neonatal cardiovascular malformations. Arch Dis Child Fetal Neonatal Ed 2008;93:F33-5. Eckersley L, Sadler L, Parry E, Finucane K, Gentles TL. Timing of diagnosis affects mortality in critical congenital heart disease. Arch Dis Child 2016;101:516-20. Dawson AL, Cassell CH, Riehle-Colarusso T, Grosse SD, Tanner JP, Kirby RS, et al. 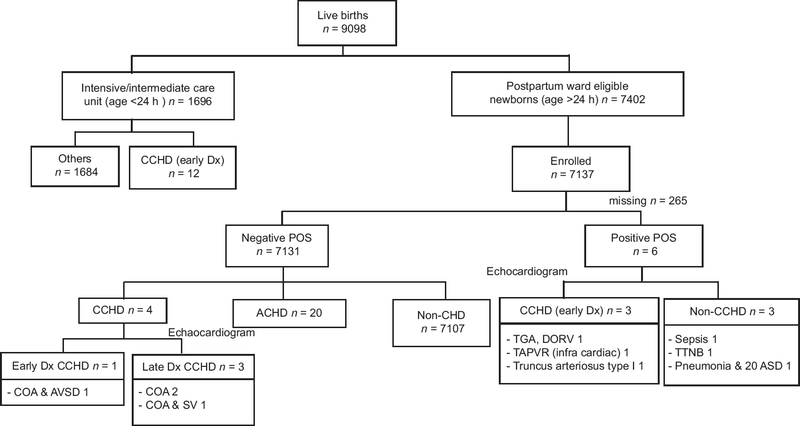 Factors associated with late detection of critical congenital heart disease in newborns. Pediatrics 2013;132:e604-11. Riede FT, Wörner C, Dähnert I, Möckel A, Kostelka M, Schneider P, et al. Effectiveness of neonatal pulse oximetry screening for detection of critical congenital heart disease in daily clinical routine – Results from a prospective multicenter study. Eur J Pediatr 2010;169:975-81. Rosati E, Chitano G, Dipaola L, De Felice C, Latini G. Indications and limitations for a neonatal pulse oximetry screening of critical congenital heart disease. J Perinat Med 2005;33:455-7. Thangaratinam S, Brown K, Zamora J, Khan KS, Ewer AK. Pulse oximetry screening for critical congenital heart defects in asymptomatic newborn babies: A systematic review and meta-analysis. Lancet 2012;379:2459-64. Saxena A, Mehta A, Ramakrishnan S, Sharma M, Salhan S, Kalaivani M, et al. Pulse oximetry as a screening tool for detecting major congenital heart defects in Indian newborns. Arch Dis Child Fetal Neonatal Ed 2015;100:F416-21. Kumar P. Universal pulse oximetry screening for early detection of critical congenital heart disease. Clin Med Insights Pediatr 2016;10:35-41. Ailes EC, Gilboa SM, Honein MA, Oster ME. Estimated number of infants detected and missed by critical congenital heart defect screening. Pediatrics 2015;135:1000-8. Du C, Liu D, Liu G, Wang H. A meta-analysis about the screening role of pulse oximetry for congenital heart disease. Biomed Res Int 2017;2017:2123918. Bakr AF, Habib HS. Combining pulse oximetry and clinical examination in screening for congenital heart disease. Pediatr Cardiol 2005;26:832-5. Ewer AK, Middleton LJ, Furmston AT, Bhoyar A, Daniels JP, Thangaratinam S, et al. Pulse oximetry screening for congenital heart defects in newborn infants (PulseOx): A test accuracy study. Lancet 2011;378:785-94. Koppel RI, Druschel CM, Carter T, Goldberg BE, Mehta PN, Talwar R, et al. Effectiveness of pulse oximetry screening for congenital heart disease in asymptomatic newborns. Pediatrics 2003;111:451-5. Wong KK, Fournier A, Fruitman DS, Graves L, Human DG, Narvey M, et al. Canadian Cardiovascular Society/Canadian Pediatric Cardiology Association position statement on pulse oximetry screening in newborns to enhance detection of critical congenital heart disease. Can J Cardiol 2017;33:199-208. Kemper AR, Mahle WT, Martin GR, Cooley WC, Kumar P, Morrow WR, et al. Strategies for implementing screening for critical congenital heart disease. Pediatrics 2011;128:e1259-67. Mahle WT, Martin GR, Beekman RH 3rd, Morrow WR; Section on Cardiology and Cardiac Surgery Executive Committee. Endorsement of health and human services recommendation for pulse oximetry screening for critical congenital heart disease. Pediatrics 2012;129:190-2. Oster ME, Kochilas L. Screening for critical congenital heart disease. Clin Perinatol 2016;43:73-80. Chang RK, Gurvitz M, Rodriguez S. Missed diagnosis of critical congenital heart disease. Arch Pediatr Adolesc Med 2008;162:969-74. Nuntnarumit P, Thanomsingh P, Limrungsikul A, Wanitkun S, Sirisopikun T, Ausayapao P, et al. Pulse oximetry screening for critical congenital heart diseases at two different hospital settings in Thailand. J Perinatol 2018;38:181-4. Hu XJ, Ma XJ, Zhao QM, Yan WL, Ge XL, Jia B, et al. Pulse oximetry and auscultation for congenital heart disease detection. Pediatrics 2017;140. pii: e20171154. Jegatheesan P, Nudelman M, Goel K, Song D, Govindaswami B. Perfusion index in healthy newborns during critical congenital heart disease screening at 24 hours: Retrospective observational study from the USA. BMJ Open 2017;7:e017580. Granelli AD, Ostman-Smith I. Noninvasive peripheral perfusion index as a possible tool for screening for critical left heart obstruction. Acta Paediatr 2007;96:1455-9. Schena F, Picciolli I, Agosti M, Zuppa AA, Zuccotti G, Parola L, et al. Perfusion index and pulse oximetry screening for congenital heart defects. J Pediatr 2017;183:74-90. Cheema JR. Some general guidelines for choosing missing data handling methods in educational research. J Mod Appl Stat Methods 2014;13:53-75. Schafer JL. Multiple imputation: A primer. Stat Methods Med Res 1999;8:3-15.